YES! .. it was a success .. we went on our first trip to Malaysia and it sure wont be the last. We left Singapore for Sunway Lagoon, Malaysia at abt 8am on 2 Sep 06 and checked in our hotel about 4pm. We unpacked, rested then freshened up and then went to Sunway Pyramid, a mall, to eat dinner and did a lil shopping. 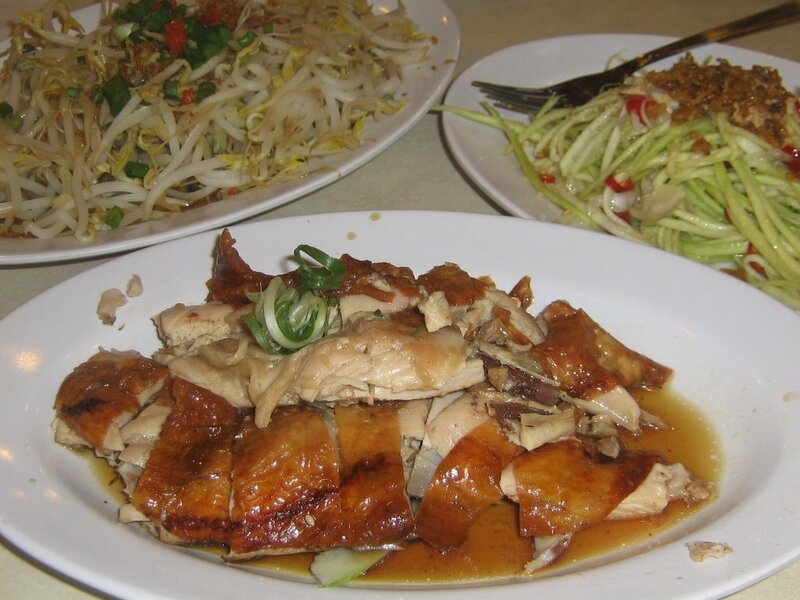 We ate at The Chicken Rice Shop .. it aint any ordinary chicken rice .. the set came with fried beansprout, mango salad (kerabu mangga), silken tofu and kueh pie tee .. slurp .. The next day, we woke up early to eat breakfast at the hotel. Breakfast was quite sumptuos and we enjoyed it. Next stop was to the Sunway Lagoon where the kids enjoyed both the wet and dry parks. 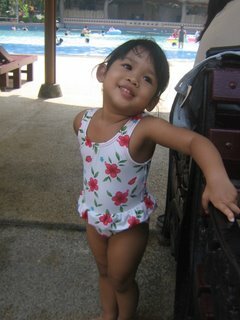 Here is a pic of Auni .. hmm .. dats a kewl pose .. dont u think. Here's another pic of her covering her booty ..
We left the lagoon at 4pm, went back to the hotel and rested. That evening we had dinner at Sunway Pyramid again. 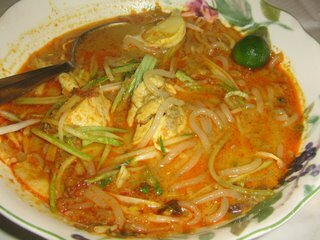 This time we settled for the Laksa Shack .. u may find the variety of laksa found in different states of Malaysia here at this shop .. 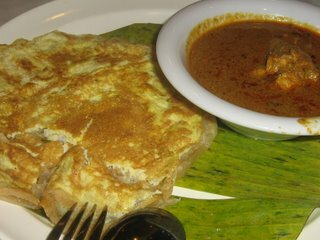 I had Nyonya Malacca Laksa .. and boy it was really gooooooooooood ..
My daughter had Prata Plaster with Chicken Curry. The last day there, we woke up a lil later to eat breakfast at the hotel again. Then did a last minute shopping. Actually i kinda shop for food - cripsy popiah, donuts from dunkin donuts and also buns from a bakery - so that the kids could snack on while on board the bus on our way home. We checked out of our hotel at 2pm then waited for our coach at the lobby. By 10pm on Monday, we reached home, tired but happy.